Odin Screenshot Expert is a full-featured screen capture tool that allows you to easily capture and annotate anything on the screen including windows, objects, menus, full screen, rectangular/freehand regions and even scrolling windows/web pages.You can save images in jpg,bmp,png all kinds of formats and the hotkey makes more convenient for you to use it. The highlight is that it can let you to print the images out.Odin Screen Capture gives you options for capturing your entire desktop, the active window, or user-defined area.It can help you quickly print a group of screens and save the images in PNG, BMP, JPEG, formats.Most important is that it includes global hotkeys,you can display or hide print screen window.It would not effect you to do other job. The setting window shows many useful information for you ,guide you how to capture and select region you want,how to make it pause and you also can continue to do your other job. So it is very easy to use. • Hotkey for show or hide print screen window. • Hotkey for capture desktop top window. • Hotkey for capture full desktop. 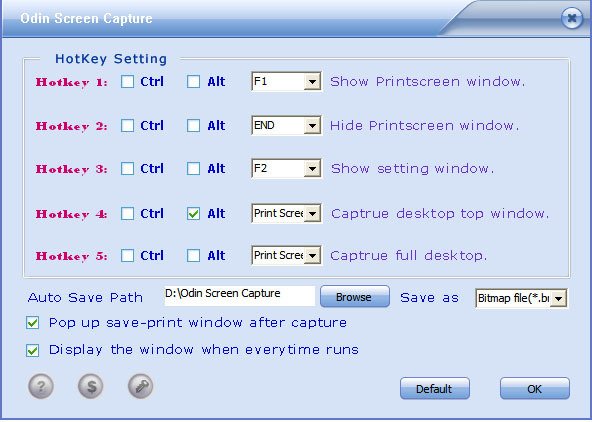 • Pop up save-print window after capture. • Display the windows when every time runs. • Guides in the setting window, user-friendly.